Dorothy Netherland paints narrative paintings full of imagery drawn mainly from 1950s women’s magazines, not in the least their ads. Her “cast of characters,” as Netherland calls them, includes an elegant woman, her fingers near her lipstick-red mouth, looking surprised, perhaps even frightened. Another woman with a scary grin embraces a faceless man. A large iron descending like a spacecraft blows steam on two women, one in a bathing suit, the other in underwear. 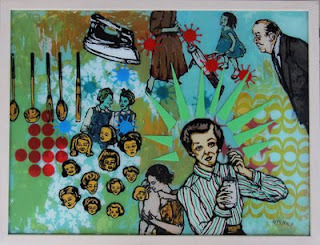 The silkscreened, coy glamour girl looking over her shoulder just so pops up many times. There’s a stroller, a Chinese takeout box and a little girl in a winter coat holding a doll. And stern looking older men observe, perhaps preside over, much of the proceedings. Yet Netherland likes to say she’s not trying to be ironic in her work. When pressed, she’s good about it, though. “I am using these images of people posing to sell the idea of the perfect house, family, life, the false idea of attainable perfection. But the narratives I put them in are anything but idyllic. So I do use irony. I just meant that I’m not intentionally trying to make ironic observations. Social commentary isn’t my goal. “But I am addressing domesticity and family drama and the expectations we have of motherhood. Our first relationships are with family. Family, especially our mother, shapes us. The paintings, including the predominance of women in them, try to reflect this and impart a sense of longing, hopefully. I also am humanizing the women in the images by subverting the original context, which presents a false, surface view of femininity. Memory, especially of personal history, is crucial to Netherland’s work. As a child, she scarcely noticed the paintings her grandfather created on the glass of clocks he made. Nor did she think that she had been affected by finding his dead body slumped over a desk as a child. But now she paints on glass. “Things about ourselves that are internalized but not acknowledged stay with us. Very soon after I started painting on glass, I realized the connection to my grandfather. “Did finding my grandfather contribute to my fear of death? Or did it just become something I would think about later to feel special? Do we all just love to mythologize ourselves?